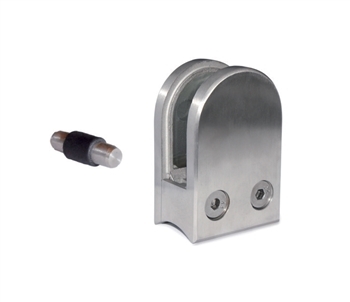 This INOX Glass Clamp has a 1 3/4" width and fits a 1-7/8 Tube. Stainless Steel Round Bar 5/16" Dia. x 19' 8" INOX Anchorage 2 15/16" Dia., 4 holes at 15/64" dia., internal hole 7/16" (Aluminium) Stainless Steel End Cap Rounded for Tube 1 1/3" Dia. Stainless Steel End Cap Henispherical for Tube 1 1/3" Dia.